Following the life of an invented apprentice to the actual Ottoman Empire architect Sinan, Turkish novelist Shafak offers a liberal interpretation of Islam. The best historical novels impose familiar tensions upon unfamiliar locales and eras, making place and time come alive with accurate details and bold imagination. Elif Shafak excels in this alchemy with her latest novel, The Architect’s Apprentice...takes place in and around the sixteenth-century court of the Turkish sultanate, and the writing is rich with the magical, sensory world of Istanbul court life, where sport is made of acquiring the rarest and most extravagant items from East and West ...Shafak’s language flows with an enjoyable and elegant confidence disturbed only by a noticeable overuse of opposites and lists, which after a time can leave the impression that there is no observation or feeling that also does not contain its contradiction; no item that exists in isolation ... The mysteries that give momentum to The Architect’s Apprentice arise as a consequence of the double lives of the novel’s principal characters. With architecture as its central motif, Elif Shafak’s novel The Architect’s Apprentice is a gripping page-turner that blends mystery with Ottoman history and Turkish folklore, combining the great heights of the Ottoman Sultanate with the desolation of poverty, war, imprisonment and the plight of the nomad ...follows the career of Mimar Sinan, the Royal Architect to the Ottoman Sultans during the 16th century and mastermind behind the Blue Mosque, the Hagia Sophia renovation, and countless mosques, hospitals, schools and aqueducts ... The climax of the novel comes when Jahan realizes that people and things are not what they seem; readers intrinsically know that the narrator isn’t, either ... Some of the novel’s mysteries are not woven through the novel all the way, and some themes are introduced, but left un- or underdeveloped ... Despite these issues, The Architect’s Apprentice is an exquisitely realized historical yarn of 16th-century Ottoman Empire. 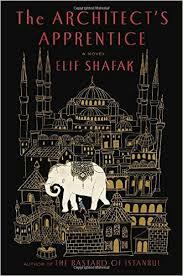 Architecture is a powerful motif in Elif Shafak’s intricate, multilayered new novel, which excels both in its resplendent details and grand design ...the finely wrought narrative is a beguiling baby elephant “as white as boiled rice” who becomes best friend to 12-year-old Jahan...ties that bind crisscross the complex story, and when the elephant is ordered to be sent as a gift to the sultan, such is the bond between boy and beast that Jahan becomes a stowaway...Jahan, who soon falls in love with the sultan’s daughter, becomes an apprentice to the sultan’s architect, Sinan, who teaches him how to build 'harmony and balance' within and without... Shafak excellently explores metaphorical bridge-building, too, between classes and cultures. This edifying, emotionally forceful novel shows how hate and envy destroy, and how love might build the world anew. What did you think of The Architect's Apprentice?